J.B. Hunt Transport Services on April 15 reported first-quarter revenue and earnings that were ahead of year-ago numbers, but which fell short of Wall Street expectations. The Lowell, Ark.-based company said that 1Q revenue rose 7% to $2.09 billion compared with $1.95 billion for the same period in 2018, while net earnings increased nearly 1.3% to $119.6 million, or $1.09 a share, compared with $118.1 million or $1.07, in 2018. Operating income dipped 1% to $168 million, compared with $169 million a year ago. However, those results fell short of the expectations of Wall Street analysts surveyed by Bloomberg News, who were expecting revenue of $2.2 billion, operating income of $196 million and earnings per share of $1.25. The company said a series of challenges caused the results to fall below expectations, including weather-related issues. “Volumes were affected by the expected rail lane closures and persistent severe winter weather events impacting Chicago operations,” according to a company statement. J.B. Hunt also cited higher driver salaries as a factor that affected its results, but officials believe the big pay raises of 2017 and 2018 are leveling off. “Benefits from the higher revenue per load and lower equipment ownership costs were partially offset by higher driver and independent-contractor costs per mile and higher recruiting costs per driver and independent contractor compared to the first quarter of 2018,” the company said. Breaking down the results by division, J.B. Hunt Intermodal reported operating income of $103 million in the quarter on revenue of $1.09 billion compared with the same period a year ago. Income was down 10%, while revenue was up 2%. The company said load volumes were down 7% from the same period in 2018, and transcontinental loads fell 8%. Combined, these events were responsible for approximately 50% of the volume decline. The company said revenue increased because of increases in its fuel surcharge and in customer rates. J.B Hunt Dedicated Contract Services generated operating income of $50 million in the quarter on revenue of $602 million compared with the same period a year ago. Income was up 24%, and revenue rose 22%. The company attributed the increase, in part, to improved productivity in its trucks, which jumped 6%. Also in the quarter, the dedicated contract services division saw its fleet grow by nearly 1,650 vehicles compared with the same period in 2018. On Feb. 15, J.B. Hunt closed on its $100 million acquisition of Cory 1st Choice Home Delivery, a Secaucus, N.J.-based furniture delivery service. “This is a strategic investment that will further advance our final-mile delivery capabilities of big and bulky products to consumers and expand our expertise in furniture delivery,” J.B. Hunt CEO John Roberts said. The purchase of Cory boosted company revenue in its final-mile services division by $26 million compared with the same period in 2018. J.B. Hunt Integrated Capacity Solutions reported operating income was up $7 million on revenue of $301 million compared with a year ago. Income was down 22%, while revenue was up 2%. The company said volumes were up 15%, but revenue per load decreased 12% primarily due to customer mix changes and lower spot priced revenue per load compared with a year ago. 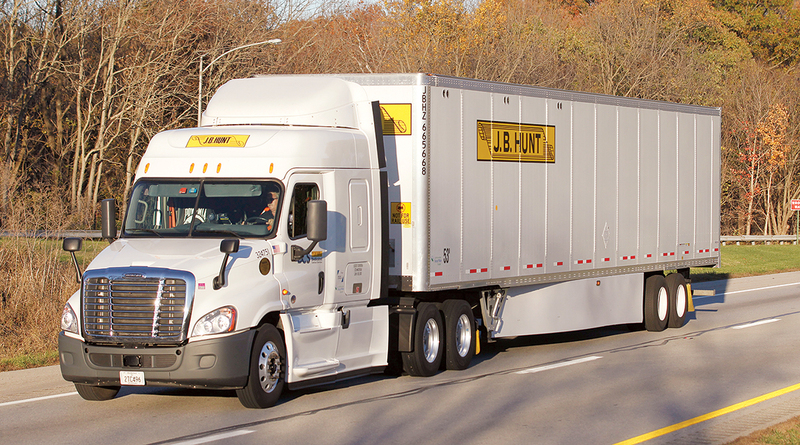 J.B. Hunt Truck reported operating income of $7 million in the quarter on revenue of $102 million. Income was up 41%, and revenue increased 10% compared with the same period a year ago. Officials said revenue excluding fuel surcharges increased 12%, primarily from customer rate increases and a 4% increase in load count. J.B. Hunt Transport Services ranks No. 4 on the Transport Topics Top 100 list of the largest for-hire carriers in North America.